A serious contender for the best golf resort in Spain, the PGA Catalunya Resort is one of Europe’s must-visit golfing hotspots. Much like red wine and steak, few things pair as well as 5-star luxury accommodation and world-class golf courses, you will find plenty of both at PGA Catalunya. Located only a 10-minute drive from Girona Airport and an hour north of Barcelona, everything at Hotel Camiral at PGA Catalunya Resort is designed with you in mind. The hotel oozes modern luxury, the stylish, elegant design promotes relaxation and the level of service you will find here is second to none. PGA Catalunya Resort boasts two fantastic courses, both more than worthy of a round, that said, the Stadium course is truly something special. Ranked 3rd of all Spanish golf courses in Golf Digest’s 2018 ‘Best Golf Courses In 206 Countries’ this championship course is a European must-play. Despite only opening for play in the late 1990s, PGA Golf Catalunya has established itself firmly in the exclusive list of Spain's best, aided by the award of a number of prestigious national and international events, both amateur and professional. The highlight came when the course was chosen to host two European Tour events in the space of 10 months, the Gene Sarazen World Open and the Peugeot Spanish Open. A culmination of more than a decade of planning and design by the European Tour, Angel Gallardo and Neil Coles, The Stadium Course offers an exciting and testing examination of golf and, due to the fact that each hole can be played from one of five separate tee positions, even golfers with the most modest of handicaps can enjoy the ride. It is from the back tees though that the Stadium Course really bares its teeth. Measuring over 7,200 yards from the tips, the Stadium Course requires solid hitting but it’s not simply a case of strength over strategy. 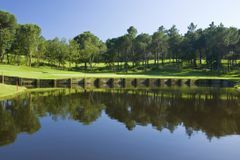 Winding its way through the foothills Pyrenees, the Stadium Course features a number of large lakes, tree lined fairways that pinch in at specific distances and well bunkered greens which are maintained to the highest possible standard year-round. All of this calls for plenty of thought and strategy from the tee and with a great deal of variety throughout, the test of golf on offer here is a dynamic and infinitely enjoyable one. After 26 previous unsuccessful attempts, Miguel Angel Jimenez finally saluted at his home open – winning a sudden-death play-off over Richard Green of Australia and Belgium’s Thomas Pieters. Jimenez let slip an early two-shot lead, the trio finishing locked at 4-under before returning to the 18th for a play-off. All three failed to find the fairway and green in regulation, but Jimenez’s up-and-down proved enough to secure his 21st European Tour title and extend his own record as the oldest winner in the Tour’s history. Asked the secret of his longevity, Jiménez said: "There is no secret. Good food, good wine, good cigars and some exercise!" The Tour Course at PGA Catalunya may be considered as the poor relation to the epic Stadium Course but that is no slight on the test of golf it offers golfers travelling to this sunny corner of Spain. Measuring 6,453 yards, The Tour Course is far less challenging than its illustrious sibling but it remains equally as enjoyable. Fairways are more generous but tee shots must still be played with care though as, like the Stadium Course, this charming layout is bordered by majestic woodland and with strategically placed bunkers and water hazards lurking in the most cunning of positions, approach shots must be carefully considered as well. Set in the heart of the PGA Catalunya Resort, Hotel Camiral is surrounded by the spectacular golf courses and gorgeous countryside views. The hotel itself is a model of contemporary luxury, designed to meet the needs of each individual that comes to stay. On the inside, Hotel Camiral is clean, spacious and stylish and equipped with all the amenities that one could need. The rooms at Hotel Camiral come with; free Wi-Fi, flat-screen satellite TV, air conditioning, Illy coffee machines and elegant, spacious bathrooms. However, it is when you step outside the room that this hotel will blow you away, with extensive options to eat, drink and relax when you’re not on the fairways. Culinary delights await you at Hotel Camiral’s 1477 restaurant, with the option to dine inside or out, offering exquisite European cuisine with a Catalonian twist. When you’re done with dinner, head to the Lounge Bar to try out the many exclusive cocktails on offer, or to sample the impressive whiskey list. For the ultimate relaxation experience, head to the Wellness Centre and soak in the hydrotherapy pool or take a break in the herbal steam room. The Wellness Centre at Hotel Camiral offers a range of spa treatments, each designed to ensure you reach peak relaxation and walk away feeling on top of the world. No trip to Spain would be complete without basking in the glory of the Mediterranean sun, Hotel Camiral’s 25-metre pool is the perfect place to do just that. The pool has its own bar, serving delicious food and drinks, so there is nothing to stop you relaxing. the whole trip was an absolute pleasure and the staff at the hotel and golf centre were wonderful. i could not rate high enough! Hotel and accommodation excellent, however dining options limited and expensive. You need to take taxi away fro resort for dining options. I think this is the best of all the golf resort hotels I have stayed at over the years. Nothing is too much trouble, everything is set up to make you feel comfortable, and the staff and knowledgeable and friendly. I took a group of 10 here and everyone enjoyed the course but the higher handicappers found it a little difficult. Course is a proper championship course and very demanding. Using forward tees makes it playable for higher handicap golfers. We had a slow four ball in front of us and had to skip a hole to get past them. Course was excellent and in great condition. we really enjoyed the whole day here. The starter noted we were going to held up and moved us to the back 9 first. We then had priority when we came back to the first tee. The facilities were fantastic and it all ran smoothly. Really enjoyed the course and would return. This is a great golf course, which is the "little brother" of the Stadium course. It was nice to have a bit of a respite on this course after the exacting challenge the day before. Make no mistake, you still have to strike it well, but you don't get beaten up. Greens were actually even better than the Stadium course, and I was generally very impressed. This is one of the finest courses in Europe. The views are spectacular, the course plays hard but fair, and (with the exception of the intimidating starter watching over you until he realises you can play a bit!) the place is relaxed, friendly and efficient. A couple of holes which would make my top 10 anywhere.